You throw a party (any excuse will do – birthday, Christmas, Thanksgiving …or just for the fun of it!). You make a movie at the party (but not just any old movie – cute family shots just don’t cut it any more – we’re talking real movies here…!) based on a great Movie Parties script. After a well-earned rest for some food, you watch the movie you’ve just made on your TV or computer. If you’re lucky, the kids will only make you watch it six times…if you’re unlucky…well, let’s just say you’d better keep the rest of the evening free! Peace breaks out all over the world and cures are discovered for all major diseases. OK, so only steps 1-3 are directly covered by throwing a movie party, but hey, we can hope. Find out more about how a movie party works. Making a movie at a party? Is that it?! Sounds pretty straightforward, we know. 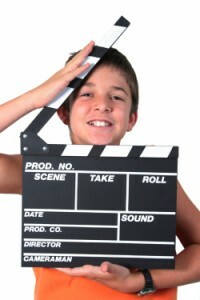 But making a fun, original movie with a clear plot, great characters and cool special effects – a movie that covers the stuff you just know that kids love to do – is a truly memorable experience for everyone involved. Put together a few kids, a great script, a camera and a few tricks of the trade, and pretty soon you’ll have the next Hollywood blockbuster on your hands. Failing that, your kids and their friends will have had the best party they can remember! Interested? Movie Parties scripts come as part of our great Party Packs. Take a look at what other parents say about their movie party experience.